A University of Bristol graduation photograph (February 2015). 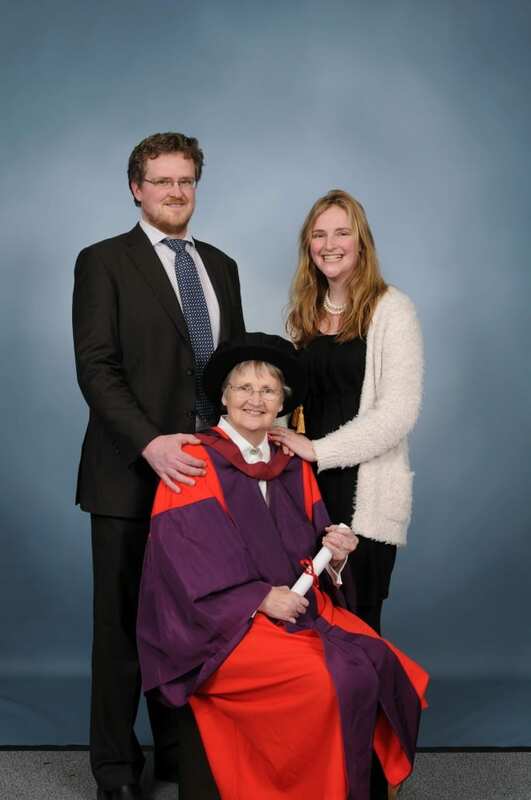 Two of my three children (Dr Rani Sheppard and Dr Stephen Robson) joined me on this happy occasion! My website: TibetanResearch.org was originally set up in 2004. Even though the content of this new website replaces much of the earlier material, its purpose remains the same. This site will introduce readers who are interested in studying Tibetan Buddhism and other faiths to a wider selection of articles than perhaps would normally be available in one location. Articles that focus on inter-religious dialogical encounters between Tibetan Buddhism and the Christian faith will be given priority. Material will range from that which is strictly academic (e.g. extracts from my PhD thesis) to essays and comments that are less academic in presentation. I was born in New Zealand at the beginning of the Second World War and spent 27 years in the Himalayas. My secondary education at the Hamilton Girls High School (1954-1958) led on to a Bachelor of Science course at Canterbury University in Christchurch, New Zealand (1959-61). The following year I gained a Diploma in Teaching and subsequently taught at Spotswood College in New Plymouth and the Waikato Diocesan School for Girls in Hamilton. In 1966 I spent a year in Australia at St Andrew’s Hall in Melbourne and focused on studying the Bible and inter-religious dialogue. I also passed two university courses in Buddhism and Indian Studies. From January 1967 until early 1980 I lived in several different Himalayan regions of North India, following which I relocated to Nepal and lived in Kathmandu until 1993. When my husband retired in the early 1990s we went to live in the UK and settled near the top of the Brecon Beacon mountains in Wales. In 2005 I moved to Bristol to embark on a PhD and I currently live in this city. 1959-61: University of New Zealand: Bachelor of Science. 1962: Christchurch Teacher’s College: Diploma in Teaching. 1966: University of Melbourne and St Andrew’s Hall. 1980: Tribhuvan University in Kathmandu: Tibetan Language. 1981: University of Saskatoon, Canada: Classical Tibetan. 1982: SOAS (School of African and Oriental Studies, University of London): Modern Literary Tibetan. 1998-2002: SOAS (University of London): Part-time MPhil studies. 1999-2007: China Tibetology Research Centre, Beijing: Study visits and seminars. 2003-2004: Heythrop College (University of London): MA course related to inter-religious dialogue. 2005-2014: University of Bristol, England: I worked on a PhD (part time) under the supervision of Professor Paul Williams.